A blog about the causes of the financial crisis. 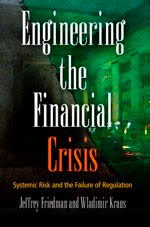 Now available from the University of Pennsylvania Press: Engineering the Financial Crisis (October 2011) by Jeffrey Friedman and Wladimir Kraus . Paul Krugman critiques the economics profession for widely shared views that failed to anticipate and ill prepared us for an economic crisis that promises to be the worst since WWII. Economic scientists have precious little understanding of this rule governed complex order, and how to keep it on its demonstrated long term path of growth and human betterment without suffering too irreparably from the kind of unpredictable reverses that we are now mired in. Less pretence and a commitment to learn from the new data being generated as I write, will be both humbling and informative, after the inevitable human political impulse to blame one’s long standing political adversaries has run its course. What is most impressive in the current crisis is that even those who find bubbles unsurprising, and who had warned of the housing bubble debacle, did not anticipate its ability to undermine the financial system so decisively and thereby to devastate a good performing economy. This is revealed in a fairly crisp timeline: residential home prices started their decline in 2006; mortgage market collapse in July-August, 2007 (which kick-started the Fed into taking “enhanced liquidity” measures); the fourth quarter 2008 events—the Treasury, Fed, FDIC joint announcement of crisis action, unprecedented extensions of FRB credit to holders of all varieties of underwater assets in implicit recognition that the financial system was under reserved and insolvent, not just illiquid. Economists and policy makers have been learning as we go, and no one can be sure how long that process has yet to go. A limits of knowledge thesis is almost always unsatisfactory: the clearer or more formal the thesis, the easier it is to see what axiom has to be changed to avoid the result. My own sense, being an attorney and PhD in choice theory, is that economists routinely ignore or dismiss systemic fraud as possibility. See William Black on control fraud. Finally, it might be helpful if economists distinguished between two senses of solution: a) a recommendation to a problem, and b) a mathematical calculation. Sense b) almost never gives you a solution in sense a). The model which allowed you to make a calculation, on the other hand, might show distinct economic processes, A and B, have something, unexpectedly, in common. That commonality might allow you to make a recommendation for a B problem based upon past success in dealing with A problems. Less pretence and a commitment to learn from the new data being generated as I write. Frydman and Goldberg on "Rationality"
Has the Recovery Been "Unstimulated"? Was It Actually a Monetary Crisis?